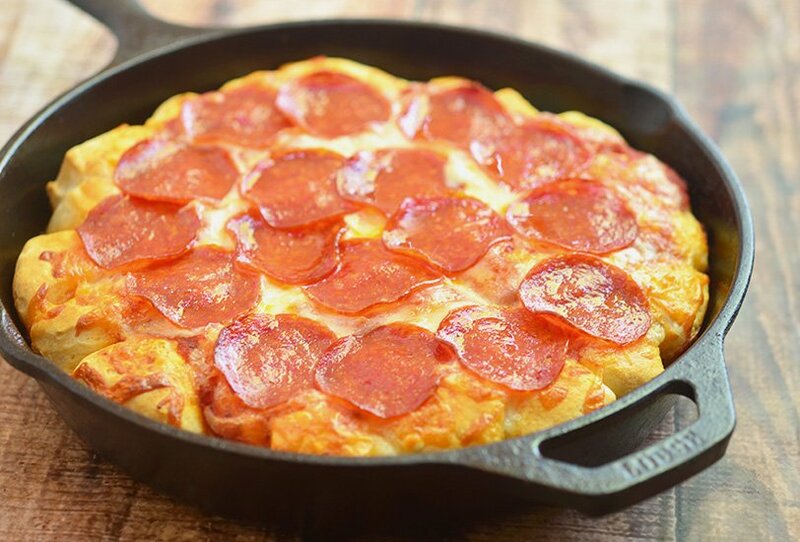 Bubble Pizza is a quick and easy pan pizza made with only 4 ingredients and in less than 30 minutes! It’s fun party or snack option everyone will devour! I am such a loyal, devoted, adoring fan of Pillsbury refrigerated biscuits, I might as well be their spokesperson. 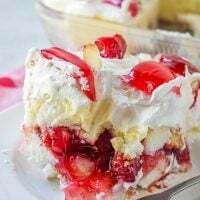 I use refrigerated biscuits in all sorts of sweet and savory treats, I am never without a tube or two in my refrigerator. I just love how I can quickly and easily turn them into donuts, breakfast bakes, cheese rolls and currently my newest favorite, bubble pizza! 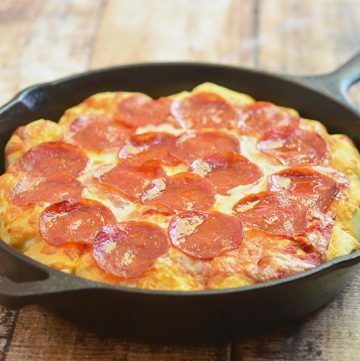 If you are looking for a fun dish that’s sure to be a family favorite or a tailgating option your guests will definitely devour, this pizza is it! It can’t get any simpler than this, folks. 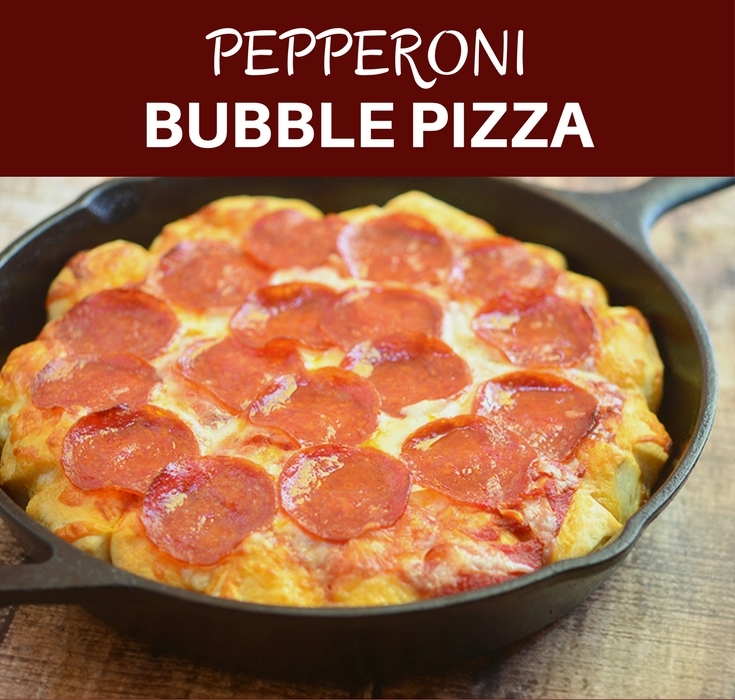 Bubble pizza is so easy to make, I feel silly even calling it a recipe. 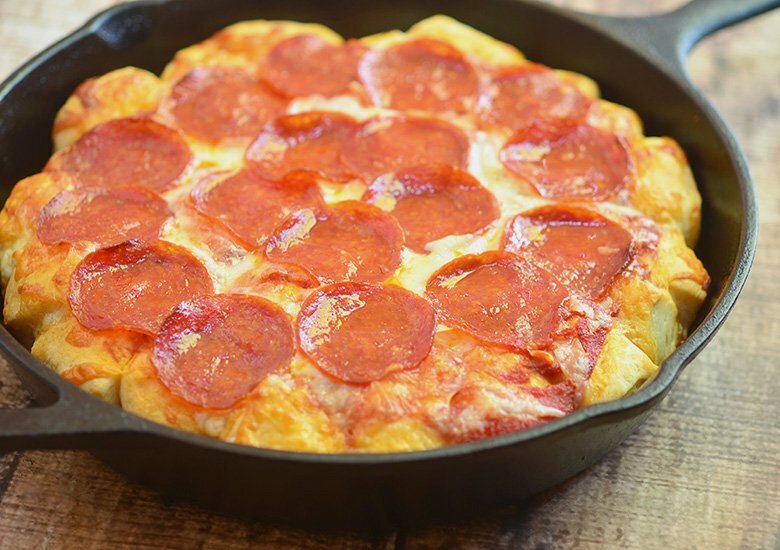 Just cut the biscuit dough into quarters, layer them in a lightly greased cast iron skillet (or any oven-safe dish), slather the pizza sauce on top and throw in whatever toppings and cheese you want which in my case were pepperoni and mozzarella. 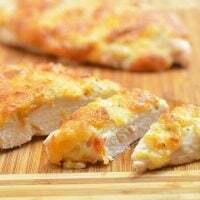 Bake for 20 to 25 minutes in a preheated oven and viola! 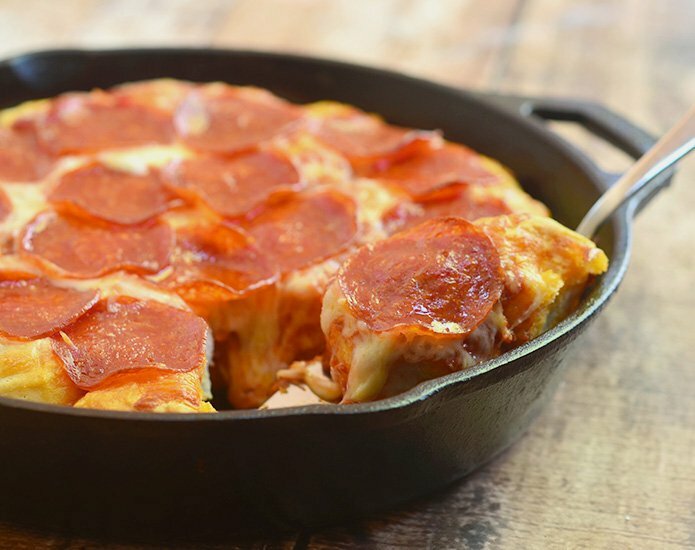 A thick, gooey, cheesy pull-apart pizza goodness. Make sure to space the biscuits when layering and don’t overcrowd the skillet to get an even crust base. If by a VERY unlikely chance you don’t finish the whole pan, leftovers can be easily warmed up in the microwave. Zap for a few seconds and the pizza pieces spring back to their previous awesomeness. Cheesy Morning Pizza-Topped with crumbled bacon, sharp cheddar cheese, and sunny side up eggs, this breakfast pizza is the best way to start your day! Southwestern Pizza-Made of flour tortilla topped with black beans, corn, tomatoes, avocados and drizzled with a creamy enchilada sauce, you can gobble this up without guilt! 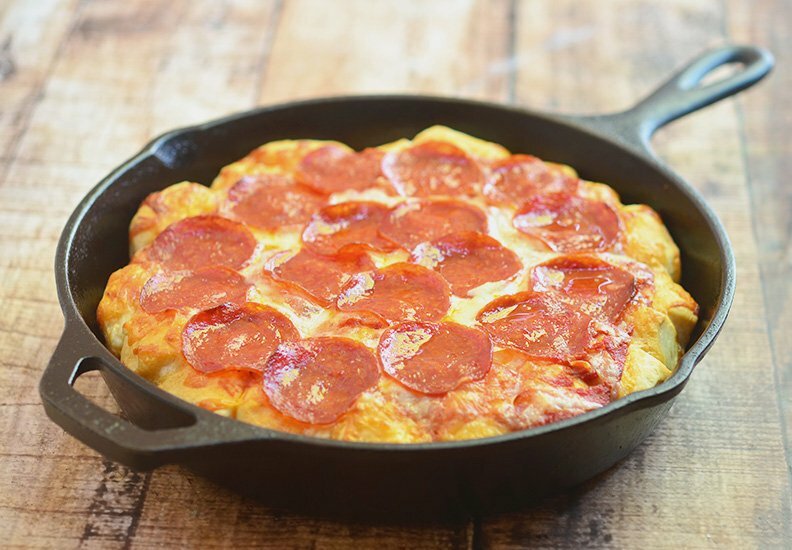 Bubble Pizza is a quick and easy pan pizza made with only 4 ingredients and in less than 30 minutes! It's fun party or snack option everyone will devour! 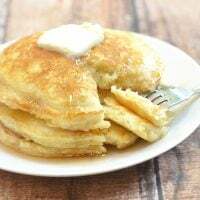 In a lightly-greased cast-iron skillet, arrange biscuit dough in a single layer to cover bottom. Do not overpack, allow a bit of room for biscuits to expand during baking. Spoon pizza sauce over biscuits and spread on the surface. Arrange pepperoni on top, overlapping pepperonis at about 1/4-inch. Bake in a 375 F oven for about 20 to 25 minutes or until golden and bubbly. Serve hot. 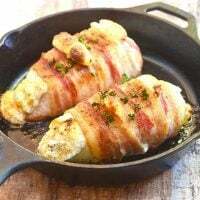 What size iron skillet should I use to make this? 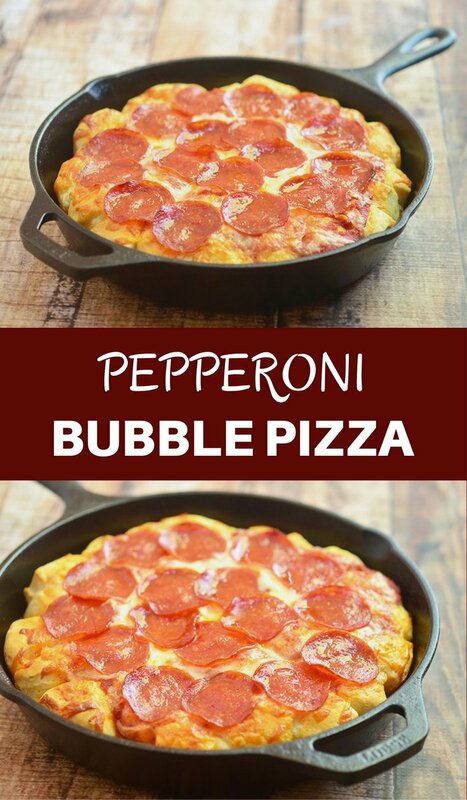 I have NEVER thought of making a bubble pizza – this is a fabulous (and delicious) idea!! It’s quick, easy and super flexible 🙂 Thanks, Aly, for the visit.